Synonyms help prevent your reader from getting bored. In the book I read last week, the author had every single character “push to their feet” at least three times in each chapter. I started getting annoyed by the tenth time. The characters never rose to their feet, eased, or even shoved. And seriously, if you are standing up, why does the author have to mention feet almost every time? Isn’t it implied they are on their feet? Nope, they all pushed to their feet. Anyway, I digress. Do you need to use synonyms every single time? No, but avoiding that type of repetition will not only make your manuscript more interesting and precise. Great writers choose specific words that create impact. It is worth taking the time to find the perfect word. 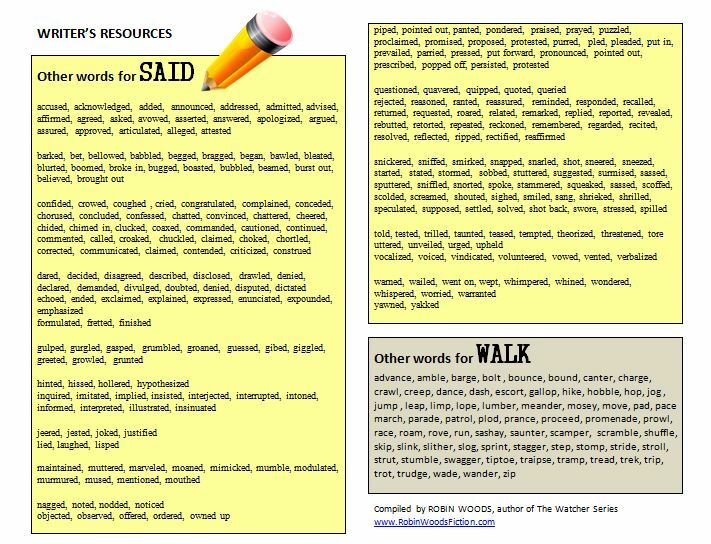 Other Words for Whisper and Went Blog Post with printable PDF. Other Words for Asked, Replied, Sat, Was, & Laugh Blog Post with PDF. Other Words for LOOK Blog Post with PDF. Posted in Writing, Writing Resources and tagged #amediting, amwriting, free pdf, free printable, improve writing, other words for, other words for said, other words for walk, robin woods, robin woods blog, robin woods fiction, said, said synonyms, synonyms, trot, walk, walk synonymns, writing, writing tips on April 6, 2015 by rwoodsfiction.